Being a space that is not limited to 4 walls, city limits, state or country boundaries makes for lots of fun and interesting opportunities. From speaking engagements, to local trade shows to incredible travel opportunities where I have the added bonus of meeting people far and wide. 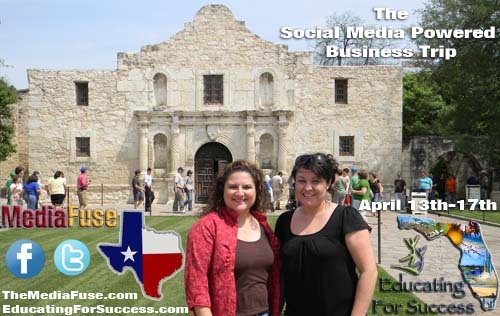 Recently I have traveled on a Social Media Powered Business Trip to showcase the power of a smartphone to do every single bit of business and multimedia while on the go. My travels took me from my home base in San Antonio, TX to Destin, FL where I was a speaker at the Educating For Success Home Business Conference. This coincided with the launch of a new company that my partner, Jackie Adame and I launched called Media Fuse. It is a company focused on Modern Marketing Practices, Mobile Tools and Social Media. Here is a sneak peek of what happened during the trip: I was able to visit with the online and social media team behind the highly successful Beaumont Convention and Visitors Bureau campaigns.Â I also met with prolific foodie video blogger Daniel Delaney of What’s This Food at a neighborhood coffee shop in New Orleans. An interview with Tom Martin and Kami Huyse on my return trip helped to complete the adventure. A full synopsis of the trip which allowed me to interview folks I had never met before who were doing some amazing things in the social space can be found on Media Fuse. If you’ve been wondering how hard it is to use mobile tools for your business, let me give you a hint: It wasn’t. 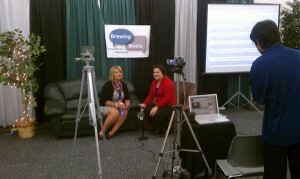 For the last couple of years I have successfully hosted “Social Media Lounges” at trade shows. 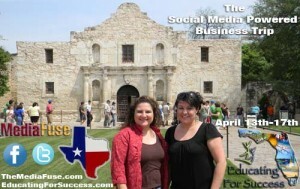 The main goal being to show business folks just how easy it is to use the social and mobile tools for their business. From live video stream interviews to audio interviews via a smartphone. The tools are simple but extremely effective. Interviews for my most recent shows at Innotech San Antonio and the San Antonio Manufacturer Association’s Trade Show can be found here and here. There are some more exciting projectsÂ in the works which I will be sharing with you soon. Things that are in the early stages but exciting none the less. If you have some fun things you are doing in the social space let me hear from you. I enjoy hearing success stories and the unique ways folks are using all the tools at our fingertips. congratulations on your success jennifer.. I totally agree that Social media is a now a great and powerful business tool that company owners should take advantage of. Keep it up and God bless on your journey.. Yes, indeed. The tools are at our disposal. They become powerful business tools when we make them a seamless part of our day.